Epic instanced Raid Zone accessed from the sub floors of Castle Mistmoore. Despite it being a T7 zone, this place is currently very popular as at least 2 classes require it for their Mythical updates. 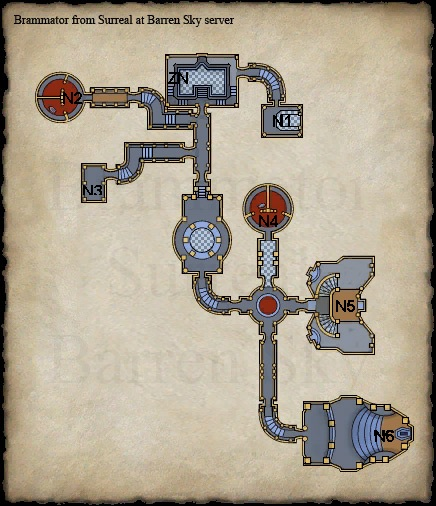 The map above is available if you remember to update your EQ2Map. The zone-in and all named are marked on the one above, but they may not be present on the in-game map. Please bear this in mind. Before you come in here, you will need at least 2 blessed spikes from a merchant in Somborn. Why? Because if you do not use them on D'Lizta Viswin and D'Lizta Cheroon's coffins, they will respawn and auto-aggro when you face Mayong. Also, you must make sure that every single named in the zone is dead, otherwise they will also auto-aggro when you face Mayong. Finally, make sure at least 1 person on the raid has some Tunarian Wolfsbane. You can get this from the Tunare deity line, killing Malkonis D'Morte in the Freethinker Hideout or by killing Wuoshi in The Emerald Halls. Also, make sure your raid members have Cure Arcane potions. The reasons behind these will be explained later. The Sharpened Heartwood Stakes are useful for this zone if you have mostly level 70's. Otherwise, level 80's can do so much DPS that it's just not worth the plat. Your arrival point for this zone is denoated as ZN on the map above. There are several trash mobs within the zone, but thankfully only 1 type will respawn, along with 1 mob near the entrance. These are the sanctum chaperones and a mistmoore blood drinker. The blood drinker should only appear after you kill the chaperone at the zone-in, but that depends on how you kill him. The trash mobs of importance are below. These have a -lot- of hit points, along with a melee damage shield. Apparently this can be dispelled for a while, but I can't remember exactly how. With a raid of T8 characters, you don't need to worry about it. They have no major special abilities, other than the damage shield putting a slow on you, so just burn them hard and fast. These are the only epic x2 mobs in the zone, and they are non-aggro. So, you might think these are an easy fight. However, if you get close to them, they run away shouting "Intruders! Intruders!" and promptly bring TWO, Level 72, epic x4 gargoyles with them. You have two ways of dealing with this trash. Arrow-pull, nuke or taunt the chaperone so they don't get the gargoyles. This means the chaperone will respawn in the zone. If you kill the one at the entrance using this method, he will respawn. Or, you can let the chaperone fetch the gargoyles and kill the lot. This is a little harder for a T7 raid force, but it can be done. The good side is that the chaperone and gargoyles will -not- respawn. If you kill the entrance chaperone using this method, a mistmoore blood drinker will respawn in his place, and continue to respawn after you kill him. This is the only chaperone that gets a vampire in his place. Now, these vampires can be a pain to fight. The worst ability they have, is they like to charm your MT. So, make sure your OT is targetting the mob directly and -always- kill these first. Have your MT call out if they are charmed and the OT will snag this mob, plus the other linked mobs so they aren't running loose through the raid. Your MT may have to stay charmed for a while as healers focus on keeping the OT alive, but if the charm can be dealt with, do so as soon as possible. Ok, easiest named fight in the zone. Pull and kill the chaperone. If you kill just the chaperone, you have 10 mins until it respawns. If you get the gargoyles with it... well, you don't need to worry about him coming back! Once it's dead, pull Enynti, either with a ranged attack, a pet or just ward your MT. You want to position him at the bottom of the stairs. The MT will want to have their back to the wall as this guy has a knockback. He has 2 AOE's on 30 second timers, Enthralling Flames and Winds of the Ancient. Both are direct damage, so have someone with ACT monitor when they hit to get timers setup. A T7 raid will need to joust the AOE's, while a T8 raid could just stand there and take it. All ranged DPS and healers need to be at max range from this guy. His other ability of note is Devitalize, which is a trauma debuff that hits only your MT. The bad thing is it drops the MT's mit and avoidance to 0, so the next hit is death. Just nominate 1 healer to spam cure on the MT. Aside from a lot of HP, you'll kill him easy. Second named in the zone... and seems to be a push-over, at least until he hits 10% hp. There are 2 strategies for this guy, depending on if you are a T7 or a T8 raid force. T7 Raid Force - This guy will be hard for you at the 10% mark. You need to make sure that -no one- in your raid is using any gear that can stun or stifle an epic mob, nor any spells or abilities that will do the same. If they are, it will eventually proc his immunity to those effects at just the wrong time and you'll be screwed. At 10%, he will emote "Forces of darkness, I call on you for the strength to prevail!". Now, at this point, if you have a Coercer/Illusionist in your raid, they need to stun him, otherwise his AOE will go off. If you happen to have 2 enchanters in your raid, then you're very lucky. Have one of them stun him at this point, and the other use their stifle ability. That should prevent him using the AOE and your raid force can just burn him down hard. However, if you do -not- have an enchanter in your raid, then things just got harder. Instead, you need someone in the MT group who can prevent AOE's, and then prefferably one in every single group after that. They will all fire off these AOE blockers when the emote comes up, and the AOE will do nothing to your raid force. It is important to prevent the AOE for three reasons. One, it does a lot of damage and will wipe most of your raid. Two, once the AOE hits, he will then re-cast it around 20-30 seconds later... and keep doing it. Three, everytime he casts it and it hits someone, he'll get a heal. The AOE is magic based, but you should be preventing it or stopping him from casting it rather than worrying about your resists. T8 Raid Force - He's still a pain if he gets the AOE off. While it won't wipe the raid, it'll give him a huge chunk of health back, and then he'll keep doing it, which means you won't be able to kill him. So, consider the possibility of the stun method above, along with AOE prevents. But, your best strategy here is just to melt his face off once he hits 10%. It can be done as long as you have a lot of heavy hitters. Don't forget to go into his room and used the Blessed Spike on his coffin! When you get to the door of this mobs room, open it and stay against the right wall to get in. Follow it until your entire raid force is standing opposite her. Make sure everyone has crouch and walk on, as the mobs do have a fear AOE. Now, what you do is have your MT rush the named and tank it, plus all the adds. Your MT group will benefit from an AOE prevent so he doesn't go down on the pull, a sanctuary would be a good idea to prevent fear as well. Your MA will target one of the adds and all DPS will proceed to burn that down. Melee should wait a few seconds for the AOE to go off and then move in. Kill off all the adds until only the named is left, then finish her off. She has a weaker version of Viswin's AOE, so you can just DPS through it. Now this mob is almost exactly the same as D'Lizta Viswin, with two noteable exceptions. A T8 raid force should just follow the strategy for Viswin and not worry about this difference in the mob. A T7 raid force? Well, you need to know that she level drains. I believe this was nerfed to 5 levels lost rather than 10, but it will hit your MT. If he isn't cured fast, he'll likely be dead. Have your OT ready to take aggro as soon as necessary, and make sure a healer is nominated to spam cures on your MT to get rid of this effect ASAP. Not only that, she has a smaller AOE that heals her and has a chance of reflecting your spells back at you. This could cause problems with the stun method. I don't believe she has a knockback, so I recomment the MT pull her to the centre of the circle room, while the rest of the raid force be at max range for DPS/Heals, and melee joust as necessary. Use ACT to get an accurate timer, as I sadly don't have one. Other than that, follow the Viswin strat... and don't forget to use the Blessed Spike on the coffin! This guy is an unusual fight, but potentially very easy. He's the same if you're a T7 or T8 raid force. Basically, he's immune to threat increase from fighters. So, your MT won't be tanking. I recommend an Assassin due to the high amount of damage they do on a backstab. This is important for reasons mentioned in a moment. So, swap your MT with a scout-type, prefferably the Assassin. Have everyone in that group buff them as if they were the MT. Now, Tactician's Armor stays as an NPC until you approach it, so this will give you time to adjust the raid as required. Once that's done, have your scout pull the Armor back to a wall. Everyone else needs to be behind the mob, all ranged DPS at max range. Your healers will be directly behind it. Why? Well, that's because the mob likes to memshuffle. He will emote "Heal no more!" and a random healer will go to the top of the hate list. At this point, your scout needs to unload their most powerful backstabs on the mob in order to get aggro back. A Coercer with Thought Snap may also work. Other than that, he's basically tank and spank. This guy is probably the whole reason you're here. First off, he may seem very tough, but once you know the timers on his abilities, you'll find him easy to deal with. Now, as mentioned, you need Wolfsbane for Mayong. It can be in your bank, or in your inventory, but 1 person on the raid will need it. This is used up during the fight and prevents Mayong from summoning werewolves to his aid. I believe he has an emote when it is used. Something along the lines of "Get that disgusting plant out of my sight!". So, you'll know when it's gone and that you're safe from extra mobs. Every 30 seconds, 2 heroic adds will spawn. These are called A Vampiric Protector and there is nothing you can do to stop them. A T8 raid force can just have the MT pick them up and burn down with AOE fire. A T7 raid force will have their OT grab these adds and assist him to burn them down ASAP. Now, Mayong also has 2 AOE's to worry about. The worst one, is Soul Paralysis. It's a cold-based AOE, direct damage and stun's whomever it hits. Because of this, your healers need to be max ranged, along with ranged DPS. He also has a mental AOE called Blanket of Eternal Night. There isn't anything you can do about this one, so just make sure you have good mental resists and take it. Keep your Melee DPS out at first, to get a feel for timers on the AOE's. Once you know the timers, get them to joust as necessary and try to keep Soul Paralysis swiped at the very least. Now, for setting up this raid, most raid forces will follow the right edge of the stairs and jump up over them to be against the wall. Your MT should be able to sneak all the way past Mayong and on to his coffin! That should allow the raid to setup for max distance easier. Mayong has no knockback, so you don't need to worry about being against a wall. For a T8 raid force, he'll be pretty easy. He just has a lot of HP to deal with. For T7, they need to get the timers on those AOE's. Once you have that, he'll be fairly easy to deal with. Mayong updates the Shadowknight and Dirge mythical weapons. This page last modified 2009-06-01 07:36:41.